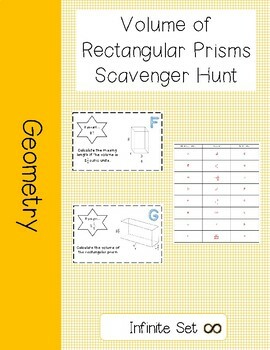 Scavenger Hunts are great self-checking activities and are more engaging than traditional worksheets. This 8 problem scavenger hunt includes decimal and fractional edge lengths. 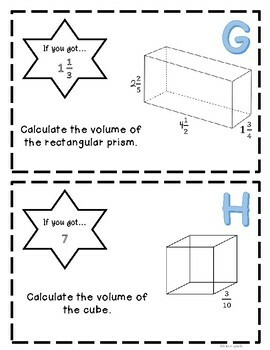 Students calculate the volume and find missing side lengths when given the volume. 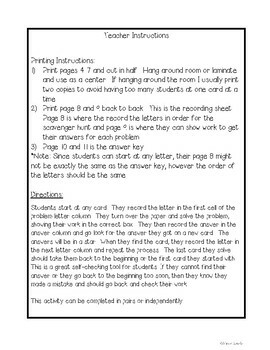 Students start at any card and solve the problem on the card recording the letter and answer. Then they look for their answer on a different card. The answers will be in a star. When they find the card, they record the letter in the next letter column and repeat the process. The last card they solve should take them back to the beginning or the first card they started with. 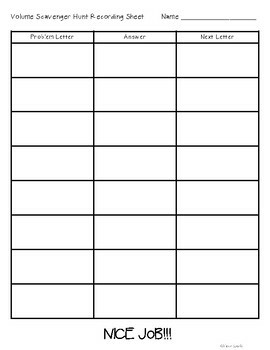 This is a great self-checking tool for students. If they cannot find their answer or they go back to the beginning too soon, then they know they made a mistake and should go back and check their work. This activity can be completed in pairs or independently.